When I was living in Russia, I found a book left in my apartment by a previous tenant called Snow by Orhan Pamuk. I knew of the author because he had just won the Nobel Prize in Literature three years earlier in 2006. Unfortunately, after a few pages I put the book down, not because of any lack of quality on the book’s part, but because I could not really concentrate on reading a book entitled Snow while in the midst of a harsh Russian winter. This same thing had happened to me at least one time earlier, when I was in Afghanistan in 2007 for a 15-month deployment with the U.S. Army. I picked up the much-praised book The Kite Runner by Khaled Hosseini from a shelf and started to read a few pages. I could not continue because at that point I wanted my pleasure reading to take me far from Afghanistan, not delve further into it. Reading habits and moods change over time, and I would normally say that it is important to not give up on books too soon. By chance, this year I remembered Orhan Pamuk and, fortunately, I can say that it was well worth my reading time. I will review his early novel The White Castle and his masterpiece My Name is Red. Pamuk is Turkish, hailing from the great city of Istanbul. His heritage is Circassian, one of those myriad peoples from the Caucasus that were nearly destroyed and then deported by the expanding Russian Empire in the 18th and 19th centuries. Pamuk, similarly to many intellectuals and free speech advocates before him, was charged and tried for remarks he made in 2005 that allegedly “insulted the honor of Turkey and Turkishness”. What he actually said, speaking about the WWI-era conflict between Turkey and its eastern neighbors, was that “Thirty thousand Kurds have been killed here [Turkey], and a million Armenians. And almost nobody dares to mention that. So I do.” The charges were eventually dropped, but this is indeed a sad state of affairs when in a country like Turkey a prominent writer (or anyone else, for that matter) cannot publicly state a proven historical fact without facing charges for denigration not of a living person but of an idea (Turkish national pride). Furthermore, in Turkey it is illegal to insult the name of Kemal Atatürk–I admire Atatürk and his great achievements, but such a counter-production restriction on free speech cannot be tolerated in a civil society. Pamuk was awarded the Nobel Prize a year later as the youngest winner (aged 54) since Joseph Brodsky in 1987 (aged 47), and only the second winner ever from a Muslim country (after the Egyptian Naguib Mahfouz in 1988). The White Castle, published in 1985, is set in 17th century Istanbul, a time when the Turks had long since stopped being invincible to the Europeans, and were actually in the midst of gradual long-term decline while the West was resurgent. The narrator is an Italian scholar who is captured by the Turkish fleet while sailing from Venice to Naples and becomes a slave in Istanbul. He claims to be a doctor and in fact his invented cures work so well that he is noticed by a powerful Pasha. He then comes under the control of a man known as Hoja (“master” in Turkish) who has an almost unbelievable physical resemblance to the narrator as well as being a scientist and scholar. The two men work closely together for decades on scientific and military projects and engage in philosophical discussions and competitions, always from their positions as slave and master. The titular fortress is one besieged by the Turkish forces in a doomed campaign against the Poles. Hoja spent years developing a great new tank-like weapon without help or advice from his Italian slave and convinced the Sultan to take it on campaign, which greatly slowed the progress of the Turkish advance. Things do not go according to plan and the master and slave depart ways permanently. The ending is somewhat predictable but still very intriguing and well done. From the very beginning of the book I felt that it shared a great affinity of style and theme with fellow postmodern writers Umberto Eco and Italo Calvino, all of whom were heavily influenced by Jorge Luis Borges. 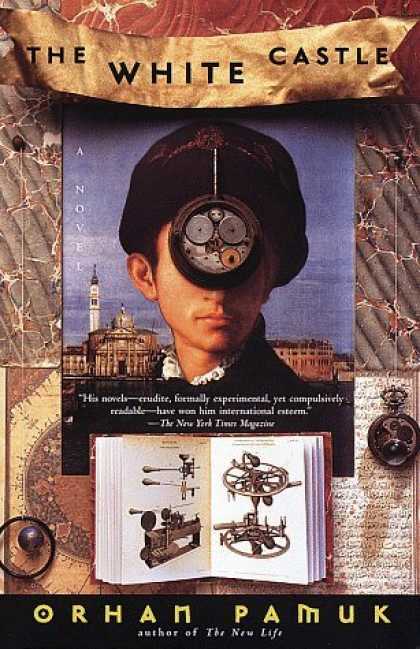 In fact, something of the story, style, and setting of Pamuk’s novel reminded me of Eco’s Baudolino. The book relies on the strength of its intellectual questioning more than the force of the actual narrative. There are many literary tools that seem to come from the Borges “kit”: a frame story written by a fictional historian, an unreliable narrator, the theme of the double or alter ego, and the ambiguity of identity and self. 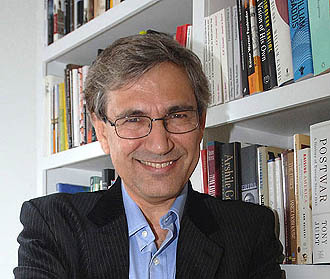 There are also themes which are particular to Pamuk: the conflict between East and West, specifically between the world of Islam and Christianity, the different rates of scientific and cultural development and modernization of the Ottoman Empire and the Christian West, and fraternal jealousy and competition. My Name is Red, published in 1998, is set in Ottoman Istanbul in the year 1591, a century earlier than The White Castle during the reign of the Sultan Murat III, a great patron of the arts. It takes place over the course of nine winter days and tells the story of a workshop of competing artists, one of whom was murdered, and the detective work by one of their former members to find the criminal. There is also a delicate love story between the main character, Black, and his beautiful widowed cousin, Shekure. The book runs many different simultaneous threads: the main one being the building suspense of the search for the murderer, the love story which also involves Shekure’s aggressive brother-in-law, and a richly ornamented commentary on Islamic art and poetry. The rival artists, whose names are Olive, Stork, Butterfly, and Elegant, are miniaturists of the style brought to Turkey by way of China and Persia, and which is opposed to the traditional Islamic art of calligraphy. 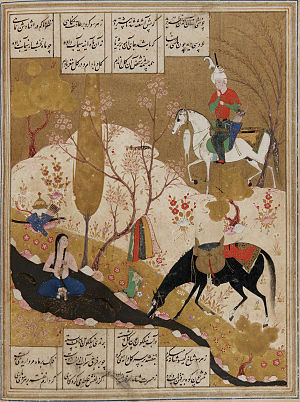 One of the most well-known stories in Persian literature is “Khosrow and Shirin” by the poet Nizami, which was a popular subject for these miniaturist painters (in this book Pamuk uses the Turkish spelling Hüsrev and Shirin). This story is alluded to throughout the novel and mirrors that of Black and Shekure. Many other classics of Persian or Ottoman art and literature, such as Firdawsi’s epic Book of Kings, are discussed at length and influence a large part of the plot. Each chapter in the novel is narrated in the first-person by a different character. It begins with the recently murdered man’s monologue, and includes almost all of the characters in the book and even a dog, a coin, and the color red. The book also uses metafiction and frequently plays on the idea that reader knows more than the characters. This is once again reminiscent of the postmodern Borgesian style. The story also strongly reminded me of Umberto Eco’s The Name of the Rose, in that they are both very intellectual and suspenseful murder mysteries set in medieval times and play on the jealousies and rivalries between men in a fraternal order. Overall, it was an extremely stimulating page-turner crafted with rare depth and skill. My reading list is long and I rarely have time or interest to reread books, but this will be an exception. In the meantime, now that my reading habits have changed again (and I live in sunny Italy rather than cold Russia), I can try again with Pamuk’s novel Snow.